Democratic Senate leader says GOP "would rather never have a vote on this"
WASHINGTON (CNN) -- Prospects for bipartisan cooperation on health care reform faded Wednesday as a key Senate Democrat called his GOP counterparts obstructionist and both conservative and liberal activists attacked the sweeping $827 billion Senate Finance Committee bill. 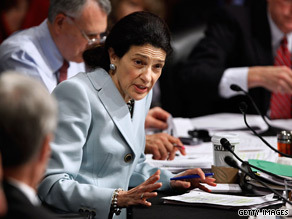 Sen. Olympia Snowe, a Maine Republican, says she hopes some bipartisanship can be restored. Another top Democrat introduced legislation that would withdraw an antitrust exemption enjoyed by private insurers since the end of World War II. The latest round of partisan bickering erupted one day after the Finance Committee approved the only health care measure so far to attract any Republican support. "I believe that the Republican leader and all of his colleagues, with the exception of a couple there ... want to do anything that they can do not to have a bill," said Senate Majority Leader Harry Reid of Nevada. "We understand that. We understand they would rather never have a vote on this. ... I am confident if their conduct is going to be as it has been in the last while, it will only be to divert attention from what is important legislation." Reid also testified at a Senate Judiciary Committee hearing in favor of legislation introduced by Sen. Chuck Schumer, D-New York, that would strip insurance companies of antitrust protection enacted in 1945. The move came two days after an insurance industry group released a report threatening to undermine Obama's assertion that it is possible to expand coverage while slowing the rate of medical inflation. America's Health Insurance Plans released a report stating that, if enacted, the Finance Committee's bill would increase premiums for families by an extra $4,000 by 2019. It said premiums for individuals would rise by an additional $1,500. "The insurance industry ought to be ashamed of this report," Sen. John Kerry, D-Massachusetts, said Tuesday. "It's a powerful argument for the attitude of an industry towards this effort. There's an old saying: If you're not part of the solution, you are part of the problem." On Wednesday, America's Health Insurance Plans started running a television ad criticizing the Finance Committee bill for seeking to limit Medicare spending. "Most people agree we need to reform health care, but is it right to ask 10 million seniors on Medicare Advantage for more than their fair share? Congress has proposed more than $100 billion in cuts to Medicare Advantage," the ad states, referring to the popular private insurance plan offered by Medicare. The ad is airing in six states: Louisiana, Colorado, Missouri, Nevada, New Mexico and Pennsylvania. Congressional Republicans also ripped into the bill Wednesday, warning that it would raise taxes for millions of Americans while doing little to rein in their insurance costs. "I don't know how you can characterize anything as reform that raises premiums, raises health care costs, raises taxes and cuts Medicare for seniors," said Sen. John Thune, R-South Dakota. The bill is "going to raise taxes significantly, and it's going to raise them on a lot of average Americans." Criticism of the bill came from the Democratic base as well. More than two dozen of the nation's largest labor unions ran full-page newspaper ads in the Washington Post and elsewhere Wednesday criticizing the bill for excluding a government-run public option. The ads also criticized the measure for imposing fines on individuals who choose not to buy health insurance, as well as for taxing high-end "Cadillac" coverage plans. "Unless the bill that goes to the floor of the U.S. Senate makes substantial progress to address the concerns of working men and women, we will oppose it," the ad says. Democratic leaders, aware of the potential liberal opposition, plowed ahead with discussions on how best to merge the Finance Committee's bill with legislation from the Senate Health, Education, Labor, and Pensions Committee. The two measures differ on a range of issues, most notably the question of whether to include a government-run public health insurance option. The Finance Committee was the only congressional panel to reject the idea. Reid, Finance Committee Chairman Max Baucus, Health Committee senior member Chris Dodd and White House Chief of Staff Rahm Emanuel met on Capitol Hill to begin sorting out the differences. "All four of us understand that legislation is the art of compromise, consensus-building, and we're going to do that," Reid told reporters. "This is why we were elected. This is legislating at its best." Health and Human Services Secretary Kathleen Sebelius, also in the meeting, described it as a "good conversation" and said the participants were "just eager to keep the momentum going." Maine Sen. Olympia Snowe, the lone Republican on the Senate Finance Committee to vote for that panel's plan, expressed hope that a sense of bipartisan cooperation could be restored. Obama and other Democratic leaders should work "to build bridges and see what can happen," Snowe said on CNN's "American Morning." She also lashed out at private insurers for opposing the Finance Committee bill, which she said could create millions of new customers and provide billions of dollars in added revenue. "This is not a solution in search of a problem. We've got rising health care costs that are going to devastate the health care system very shortly," she asserted. CNN's Kevin Bohn, Alex Mooney and Alan Silverleib contributed to this report.